Lyon striker Alexandre Lacazette limped off as the Ligue 1 leaders beat Metz to go four points clear of Marseille. Lacazette, 23, who has scored 21 goals in 22 league games this season, opened the scoring from the penalty spot before he was substituted. Corentin Tolisso added a late second for Lyon against the visitors, who had Guido Milan sent off early on. Lyon have won seven league games in a row, while Metz stay in the drop zone. Elsewhere, Caen climbed off the bottom of the table after goals from Sloan Privat, Lenny Nangis, Julien Féret and Damien Da Silva secured a shock 4-1 victory at Rennes. Evian leapfrogged Toulouse and edged away from the relegation zone after Adrien Thomasson's early goal gave the home side a 1-0 win. Nineteenth-placed Lens played out a 0-0 draw at mid-table Reims. On Friday, second-placed Marseille lost 2-1 to 10-man Nice, with Romain Genevois and Niklas Hult scoring for the hosts before Florian Thauvin got one back for Marcelo Bielsa's Marseille side. Match ends, Lyon 2, Metz 0. Second Half ends, Lyon 2, Metz 0. Kévin Lejeune (Metz) wins a free kick in the defensive half. Attempt missed. Maxwell Cornet (Lyon) right footed shot from the right side of the box misses to the right. Assisted by Yoann Gourcuff with a through ball. Attempt missed. Maxwell Cornet (Lyon) left footed shot from outside the box is just a bit too high. Assisted by Yassine Benzia. Attempt saved. Gaëtan Bussmann (Metz) left footed shot from outside the box is saved in the centre of the goal. Substitution, Lyon. Yassine Benzia replaces Nabil Fekir. Offside, Lyon. Jordan Ferri tries a through ball, but Nabil Fekir is caught offside. Foul by Juan Manuel Falcón (Metz). Goal! Lyon 2, Metz 0. Corentin Tolisso (Lyon) right footed shot from outside the box to the bottom left corner. Assisted by Yoann Gourcuff. Attempt missed. Guirane N'Daw (Metz) left footed shot from outside the box is too high. Assisted by Bouna Sarr. Attempt missed. Yoann Gourcuff (Lyon) right footed shot from outside the box misses to the left. Attempt blocked. 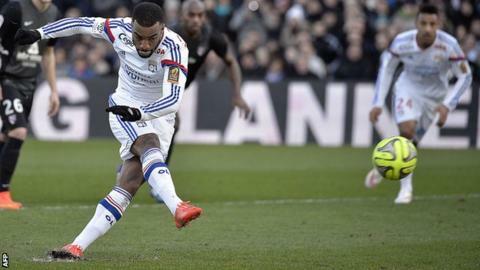 Maxwell Cornet (Lyon) left footed shot from the centre of the box is blocked. Attempt missed. Corentin Tolisso (Lyon) with an attempt from the centre of the box misses to the left. Assisted by Yoann Gourcuff with a cross following a corner. Corner, Lyon. Conceded by José Luis Palomino. Substitution, Metz. Juan Manuel Falcón replaces Chris Philipps. Christophe Jallet (Lyon) wins a free kick on the right wing. Foul by Kévin Lejeune (Metz). Offside, Lyon. Jordan Ferri tries a through ball, but Maxwell Cornet is caught offside. Attempt blocked. Jordan Ferri (Lyon) right footed shot from outside the box is blocked. Assisted by Christophe Jallet. Attempt missed. Nabil Fekir (Lyon) right footed shot from outside the box misses to the right. Assisted by Mouhamadou Dabo. Maxwell Cornet (Lyon) wins a free kick on the left wing. Foul by Jonathan Rivierez (Metz). Attempt missed. Rachid Ghezzal (Lyon) header from the centre of the box misses to the right. Assisted by Mouhamadou Dabo with a cross. Jonathan Rivierez (Metz) wins a free kick in the defensive half. Foul by Guirane N'Daw (Metz). Attempt saved. Rachid Ghezzal (Lyon) left footed shot from the right side of the box is saved in the bottom left corner. Assisted by Maxwell Cornet with a through ball. Corner, Lyon. Conceded by Johann Carrasso. Attempt saved. Jordan Ferri (Lyon) right footed shot from outside the box is saved in the bottom left corner. Assisted by Mouhamadou Dabo. Corner, Metz. Conceded by Christophe Jallet. Attempt missed. Maxwell Cornet (Lyon) header from very close range is just a bit too high. Assisted by Christophe Jallet with a headed pass following a corner.